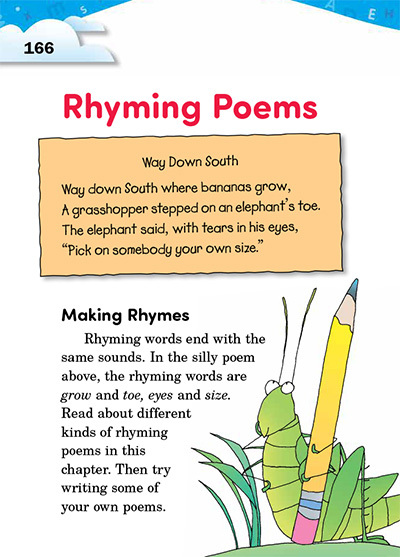 Have a volunteer read the rhyming poem aloud to your class. Then lead a discussion about it. Let students know they will get to play with rhymes in this chapter and come up with their own silly (or serious) poems. Once students have made and shared their lists, they will have many rhyming words to work with to build couplets and triplets. Read aloud the poems on this page. Point out the rhyming words at the ends of the lines. Then have students try their own poems. They should pick out two (or three) rhyming words and experiment with writing lines that lead up to them, creating their own couplets (or triplets). If students stack two couplets, they get one kind of quatrain (first and second lines rhyming, third and fourth lines rhyming). They can write another kind of quatrain by rhyming the second and fourth lines. Read aloud the two examples on this page. For each example, go back to point out the rhyming words. Have students use some of their rhyming words to create quatrains, following one of the patterns shown on this page. After students have experimented with rhyme, they are ready to play with other types of sounds. Alliteration: Write a line that repeats the sound st at the beginning of many words. Onomatopoeia: Write a line with words that sound like wind in trees. Simile: Write a line that compares two things using "like" or "as." Personification: Write a line that makes a nonhuman thing do something human. Now ask students to write a rhyming poem entitled "When I Am Happy." It can be a couplet, a triplet, or a quatrain. Ask them to include one or more of the types of pleasing sounds they have practiced on this page.